Justin and Morgan confirm that there are indeed bass in the pond. Future coop in behind the fence; it needs a little sprucing up. Mercury light on the barn. Looking forward to Cattail Chowder! Several weeks before moving, while having some work done on the exterior of my house on Warren's Way, the Blue Boy Phlox was trampled inadvertently by the carpenter. In the grand scheme of things this was pretty minor, but it felt like this was beginning to be a metaphor for some of the changes in my life, and the possibility of moving to Alewive Pond Farm-- simple things I'd grown accustomed to being moved aside to make way for a new path full of unknown, unproven promises...It was after all a handful of perennials, and they would return next year. 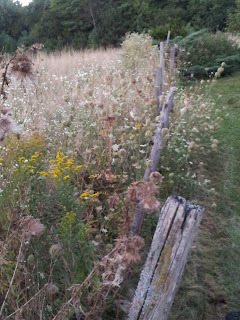 It was several trips up and down the driveway, past some of the flowers by the pond, before I stopped next to a small bush of lavender flower clusters. I realized stepping closer this was a small hedge of Blue Boy Phlox much bigger than the ones lost earlier with the deck construction. Smiling I leaned over to smell the creamy vanilla scent, and thought how wonderful it would be if this was indeed a metaphor for the new stories to come with Bev on Alewive Pond Farm.